ACID cigars by Drew Estate are a blending of ancient and Old World tobacco knowledge with a bit of daring to be different. Expressed in distinctly different lines, every single cigar within the ACID family is a unique smoking experience. ACID cigars are handcrafted at the Drew Estate factory in Nicaragua using the world's finest tobaccos with over 140 botanicals, herbs, and essential oils to produce their unique flavor and aroma. And, like all Drew Estate cigars, the construction of the ACID is impeccable. 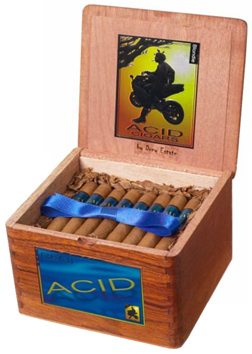 The ACID Remi (Blue) line of cigars is a mainstay of ACID aficionados because of the cigars' mellow, rich flavors, sweet tastes and captivating aromas. The Remi line is the careful combination of the finest mild cigar tobaccos infused with all natural herbs, essential oils, and an extra touch of floral botanicals. These are the cigars of choice by those seeking total relaxation from the daily rigors of life. 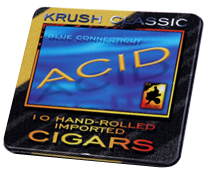 ACID Krush Classic Blue Connecticut for the ACID fan on the go! Packaged in a collectible tin, these Blue Connecticut petite cigars/cigarillos have all of the distinctive tastes that you enjoy in the ACID Blue Herbal blend. Handcrafted with mild Connecticut wrappers surrounding the finest longfiller Nicaraguan tobaccos.